Oppositions protest cross the limits. The United National Party and the Protest of the Opposition together held a protest today in front of the Fort Railway station against the incident that took place at Weliweriya recently. 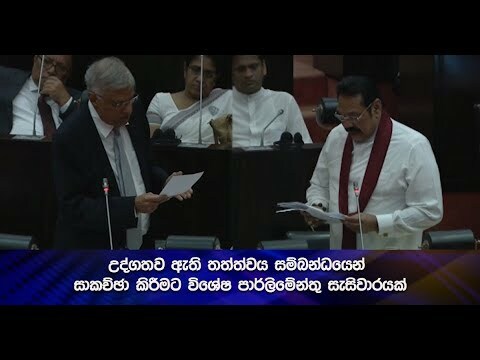 Our correspondent reported that the Leader of the UNP Ranil Wickramasighe along with the leaders of political parties that make up the Protest of the Opposition took part in this protest. The protesters who began with holding placards and shouting slogans in front of the Fort Railway station subsequently sat on the main road and continued their protest. Leader of the UNP Ranil Wickramasinghe had the following to say during the protest. A group of prominent politicians including the leader of the United Socialist Party Sirithunga Jayasuriya, TNA parliamentarian M. A. Sumandiran took part in the protest and leader of the Democratic People’s Front Mano Ganeshan expressed the following views during the protest. Due to this protest, traffic was hindered along several roads that lead to the Colombo Fort area. The Police Headquarters stated that due to this the road leading from the Moratuwa Technical Junction to Fort was closed. However at the end of the protest the protestors attempted to go towards the Presidential House along the Lotus Roundabout. Our correspondent at the scene stated that the members of the opposition were attempting to the march to the Presidential House to hand over an epistle containing their demands. However the police prevented the procession from proceeding beyond the Lotus Roundabout and subsequently several members of the Protest of the Opposition had handed over the epistle to the Presidential Secretariat. Meanwhile, during this protest the courts had issued an order preventing protest marches and also acting in a way that impedes the public and vehicular traffic. The order was issued by Colombo Additional Magistrate Mohammed Sahabdeen after perusing facts presented by the Fort Police.